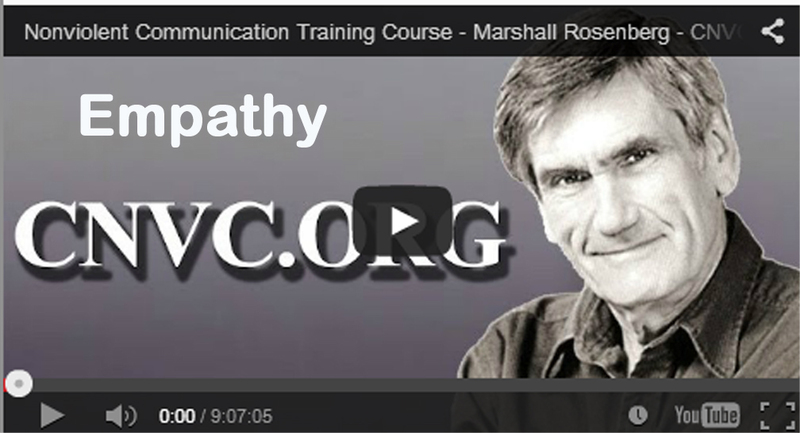 Many NVC trainers have a great deal of hands on experience with empathy and how to embody and live it. There is a large international network of these trainers. In nonviolent communication, no matter what words others may use to express themselves, we simply listen for their observations, feelings, needs, and requests. Then we may wish to reflect back, paraphrasing what we have understood. We stay with empathy, allowing others the opportunity to fully express themselves before we turn our attention to solutions or requests for relief. Rosenberg: Empathy, I would say is presence. Pure presence to what is alive in a person at this moment, bringing nothing in from the past. The more you know a person, the harder empathy is. The more you have studied psychology, the harder empathy really is. Because you can bring no thinking in from the past. If you surf, you'd be better at empathy because you will have built into your body what it is about. Being present and getting in with the energy that is coming through you in the present. It is not a mental understanding. Question: Is it speaking from the heart? "I've been quoted on the subject of empathy in a recent book edited by Josh Baran titled 365 Nirvana Here and Now: Living Every Moment in Enlightenment. The author excerpts a passage in which I compared empathy to surfing. I said that empathy is like riding on a wave; it's about getting in touch with a certain energy. But the energy is a divine energy that's alive in every person, at every moment. Unfortunately, many of us are blocked from that divine energy by the way we've been taught to think. But for me, empathy is getting with that energy that's coming through the other person. It's a divine experience. I feel as if I'm really in a flow with divine energy. And when two people connect in that way, any kind of conflict can be resolved so that everybody's needs get met. When we teach people to empathize with people from other cultures who are behaving in a ways we do not like, we find ways of resolving our differences peacefully. So empathy is a beautiful experience when we have it. And it's powerful to work toward peace in diplomatic relationships based on empathy, not on our usual adversarial tactics. Now when we can empathize with what's alive in another person, it's amazing how much healing can go on. Unfortunately, there's a lot of healing that needs to happen in the world because of the pain people are in, and I'm often called to help individuals who have been victimized by people with different religious beliefs. I recommend allowing others the opportunity to fully express themselves before turning our attention to solutions or requests for relief. When we proceed too quickly to what people might be requesting, we may not convey our genuine interest in their feelings and needs; instead, they may get the impression that we're in a hurry to either be free of them or to fix their problem. Furthermore, an initial message is often like the tip of an iceberg; it may be followed by yet unexpressed, but related - and often more powerful - feelings. By maintaining our attention on what's going on within others, we offer them a chance to fully explore and express their interior selves. We would stem this flow if we were to shift attention too quickly either to their request or to our own desire to express ourselves. Suppose a mother comes to us, saying, "My child is impossible. No matter what I tell him to do, he doesn't listen." We might reflect her feelings and needs by saying, "It sounds like you're feeling desperate and would like to find some way of connecting with your son." Such a paraphrase often encourages a person to look within. If we have accurately reflected her statement, the mother might touch upon other feelings: "Maybe it's my fault. I'm always yelling at him." As the listener, we would continue to stay with the feelings and needs being expressed and say, for example, "Are you feeling guilty because you would have liked to have been more understanding of him than you have been at times?" If the mother continues to sense understanding in our reflection, she might move further into her feelings and declare, "I'm just a failure as a mother." We continue to remain with the feelings and needs being expressed: "So you're feeling discouraged and want to relate differently to him?" We persist in this manner until the person has exhausted all her feelings surrounding this issue. What evidence is there that we've adequately empathized with the other person? First, when an individual realizes that everything going on within has received full empathic understanding, they will experience a sense of relief. We can become aware of this phenomenon by noticing a corresponding release of tension in our own body. A second even more obvious sign is that the person will stop talking. If we are uncertain as to whether we have stayed long enough in the process, we can always ask, "Is there more that you wanted to say?" A mother can't breastfeed her infant if she doesn't receive adequate nourishment herself. Likewise, if we find ourselves unable or unwilling to empathize despite our efforts, it is usually a sign that we are too starved for empathy to be able to offer it to others. Sometimes if we openly acknowledge that our own distress is preventing us from responding empathically, the other person may come through with the empathy we need. At other times, it may be necessary to provide ourselves with some "emergency first aid" empathy by listening to what's going on in ourselves with the same quality of presence and attention that we offer to others. The former United Nations secretary-general, Dag Hammarskjold, once said, "The more faithfully you listen to the voice within you, the better you will hear what is happening outside." If we become skilled in giving ourselves empathy, we often experience in just a few seconds a natural release of energy which then enables us to be present with the other person. If this fails to happen, however, we have a couple of other choices. We can scream - nonviolently. I recall spending three days mediating between two gangs that had been killing each other off. One gang called themselves Black Egyptians; the other, the East St. Louis Police Department. The score was two to one - a total of three dead within a month. After three tense days trying to bring these groups together to hear each other and resolve their differences, I was driving home and thinking how I never wanted to be in the middle of a conflict again for the rest of my life. The first thing I saw when I walked through the back door was my children entangled in a fight. I had no energy to empathize with them so I screamed nonviolently: "Hey, I'm in a lot of pain! Right now I really do not want to deal with your fighting! I just want some peace and quiet!" My older son, then nine, stopped short, looked at me, and asked, "Do you want to talk about it?" If we are able to speak our pain nakedly without blame, I find that even people in distress are sometimes able to hear our need. Of course I wouldn't want to scream, "What's the matter with you? Don't you know how to behave any better? I just got home after a rough day!" or insinuate in any way that their behavior is at fault. I scream nonviolently by calling attention to my own desperate needs and pain in this moment. If, however, the other party is also experiencing such intensity of feelings that they can neither hear us nor leave us alone, the third recourse is to physically remove ourselves from the situation. We give ourselves time out and the opportunity to acquire the empathy we need to return in a different frame of mind." Dynamics of empathy as practiced within Nonviolent Communication. The image goes this way, I relate empathy to surfboard riding. I say, imagine yourself getting up on a surfboard. This entails getting in touch with a certain energy. If you get on exactly, you can get knocked off. To me, empathy is somewhat like that Empathy is getting in-touch with a life energy that is coming through another person. ."
"In this session, I'll be showing the power that empathy has in 3 functions. Healing, mediation, and reconciliation. In the previous session we looked at the dynamics of empathy. We saw how it requires our full presence to another person. And full presence on what's alive in them, what they are feeling and needing. An now in this session I will show just how powerful that process can be in healing past wounds, mediating conflicts between people, and reconciling groups that are at war with each other, to see how they can live in peace and harmony. The power of empathy. First, let's look at how empathy supports healing." just to receive empathy for our pain. it's an important contribution to healing. 2. if a person in pain can empathize with the person that stimulated their pain, that can be healing. what's alive with you now about what happened in the past. what are you feeling and needing now. mediator - empathizing with peoples feelings and needs. A method using compassion, understanding, empathy, to transform wars and conflicts, promoting Human Capacity to contribute to the well being of others. They don't realize that when they say that they are taking the focus away from the other person and putting it on their feelings. It is real important that we see the difference that we see the difference between sympathy and empathy." Empathy is like being fully engrossed in a book.. So being engrossed in the other person. Martin Buber calls this presence. It's the most precious gift one person can give to another.. Studying psychology makes empathy harder. "This is a very powerful gift when we can give it. Studies of healing show that it's primary factor in healing, the degree to which the listener can just empathically connect and not try to direct, or analyze, give advice." A problem in a relationship. The person probably had a need for empathy. Sometimes you have to guess the needs. "..What makes you confused about this? - Cause I don't know how to respond to those needs - What it would take is just empathy; if she could just feel the empathy that I just gave her; if you could just say: "Are you feeling in pain because you havethe need for reassurance that your needs matter? - Yes, yes! I've tried to tell you that foryears! You don't listen!" - I'm guessing now I'm feeling sad because I'm not meeting ..ehm......the needs. - Hold your sadness, she needs more empathy. Actually I needed to give her some emergency first aid empathy, before I could pull her by the ears to get her to hear him." 26:44 Now, see, it hasn't been easy for me to give this jackal empathy. 27:00 empathic connection before education. 45:44 if they first feel empathy for their feelings and needs. 49:47 which is done through the empathy. 51:48 to give both of them the empathy they need to hear each other. 52:04t o give the empathy to each of them so they can then hear each other. Empathy, give the full attention to someone. Gives presence. Intellectual understanding - get this at university -i.e. theories and ideas. This blocks connecting to the felt experience of the person in the moment. Sympathy - Feeling sad for someone. we are talking about ourselves. I understand how your feel - but they really don't understand. instead demonstrate understanding. "the empathy is the second part, he's seeing this other persons humanness, and the way we see the humanness is to see the needs without these enemy images clouding that. It's not easy to do that and requires full presence to what is alive in this other person."